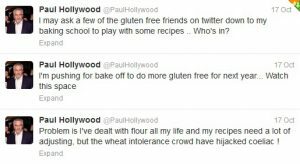 talkhealth > Blog > 2013/10 > What did Paul Hollywood really say about coeliacs? he was “sceptical about the whole Coeliac thing”. He also said he thought that coeliac disease is often “misdiagnosed” and that people should try different breads citing Sourdough bread as an example. This has left coeliac’s across the country furious. If you have been diagnosed with coeliac disease you can’t eat any bread, no matter how healthy and simple the ingredients are if it’s been made using wheat. I watched this furore with some confusion. Having just watched The Great British Bakeoff where contestants had to experiment cooking a gluten free dish and also seeing other positive comments Paul Hollywood was making on Twitter which are very supportive to coeliac disease, I wanted to find out more. 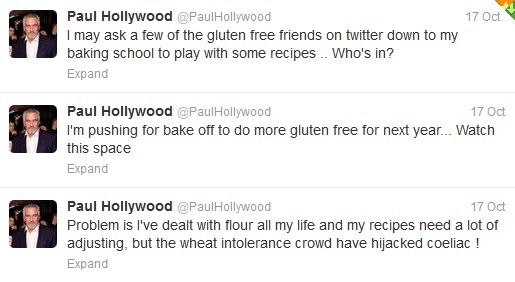 Excuse me Paul – I most certainly have NOT hijacked coeliac. How ‘very’ dare you. I am wheat intolerant and when I eat wheat I get terrible stomach cramps, pain, bloating and wind. It’s painful and unpleasant and although I have not been diagnosed with coeliac disease, I still can’t eat wheat unless I’m feeling particularly sadistic. The solution for me is the same as for coeliacs – avoid wheat. But I think what Paul means here is people who are eating gluten free as a choice or know they have a problem with digestion and self diagnose gluten as the problem. There is a huge move towards ‘going gluten free’ amongst sportsmen and women and celebrities. But it’s not necessarily healthy at all if you eat processed gluten free foods in large amounts. They often contain far more fat, sugar and salt to make them taste good and perform better in the oven. So what did he actually say? Did anyone actually hear these words spoken or watch the interview in question? Are we jumping to conclusions and giving Paul Hollywood a bad press where it isn’t really deserved? Diagnosis can take 7-14 years in some cases and there is a lot of misunderstanding about irritable bowel syndrome. If doctors are confused then can we really blame a celebrity chef for a few possibly ill chosen words? Especially one who does seem to have some passion and understanding for baking gluten free. We should be encouraging him and thanking him for taking an interest in tackling the challenge that is baking gluten free. Anyone who has tried will know it’s quite a challenge when the gluten is not present. I think he is doing a great job and when you consider how few celebrity chefs give even a passing thought to coeliacs or those with allergies, we should be a little more lenient. It must be confusing for chefs when a diner says they are gluten free, a dish is prepared, totally gluten free for them and then they go and order a pastry dessert. There are a lot of people using the term ‘coeliac disease’ or requesting gluten free or allegen free food as if it’s vital to their health. If they aren’t actually allergic their actions can cause a lot of confusion when they are then seen tucking into the very thing they claimed to need to avoid. They don’t do us true allergics or coeliac’s any favours. So if you’re listening – all you people going gluten free by choice. Tell restaurants this, especially if you’re going to give in and eat the cheese and crackers for pudding. So if you listen to this radio programme and hear what he actually said, what do you think?